Daniel Ingalls is one of the most important participants of this WikiSym edition. He’s participating as an invited speaker and we interviewed him just in time to get you some information on his career. 1. When has you career in Software Development started? 2. Considering what you invented, do you think that you have revolutioned computer programming and architecture? I do feel that I’ve contributed to some good progress, but I’ve never felt it was a “me” thing. I’ve had a lot of fun, drawn energy from the people and things around me, and I hope I’ve given back some of the same. 3. Is there anything you would still like to do, in that area, that you haven’t done yet? I still feel that things can be simpler. I hope that, with the help of increasingly high-level language tools, we may be gradually able to leave the language wars behind us, and move into an era of focus on the more basic semantic models, relationships, and architectures. 4. What do you foresee to happen in a near future, considering the current trends of informatics? I believe that this trend we call “Web 2.0” will continue, as an exciting recreation of the personal computer revolution, but now in the context of dynamic languages and the web. 5. When did you start getting involved with wikis? Around the time when Squeak came out with one of the first really simple, small Wiki kernels. But this was not my work, except for the system in which it was built. 6. What do you think that could be improved on platforms like wikis? I think of everything on the web as being active, so I look to the future of Wikis as being an editable world of active objects. 7. What are your expectations towards this edition of WikiSym? Have you participated on events like this before? This is my first visit to WikiSym, and I have no expectations, except to share some of the excitement of new possibilities. 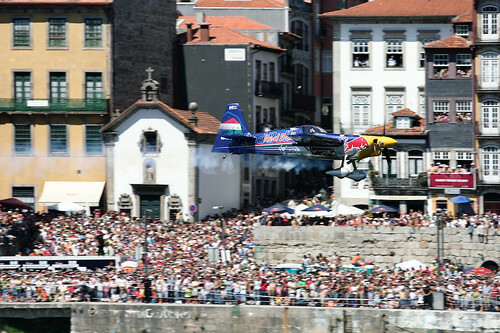 As you may already know, one of the Red Bull Air Race World Championship’s races will happen in Porto, on 6th and 7th September. It’s one of the ten cities to host this unique event, for the second time now. The first time was last year, 2007, as was a huge sucess both for viewers, organizers and for the hosting community. The race over the River Douro will be the eight of this season, which will be followed by a race in Spain (maybe in Vallencia, but still not confirmed, hapenning in September 27th and 28th) and the last one in Perth (Western Australia, in November 1st and 2nd). The race days in 2007 were compared to the S. João’s evening (in English, St. John), the traditional popular festival, in June, when thousands of people hang out on the streets of Porto and surroundings all night. The two cities of Oporto and Vila Nova de Gaia face each other from opposite sides of the Douro river – Oporto in the north bank and Gaia in the south. Six Pontes, or bridges, in total, join them. Of those, Ponte Dona Maria and Ponte Dom Luís, the two oldest ones, were built in the 19th century, respectively by Gustave Eiffel and by his partner in business, Théophile Seyrig. Ponte da Arrábida, Ponte de São João and Ponte do Freixo date from the 20th century, while the newest one, Ponte Infante Dom Henrique, is no older than the 21st century. Being one of the oldest cities in Europe, Oporto is proud of its well preserved historical quarter and was awarded World Heritage Site status by UNESCO in 1996. Oporto and Gaia are further connected by the famous Oporto wine, traditionally stored in wine cellars that over the years have been built in Gaia and act as a magnet for tourists visiting Northern Portugal. There stand the names of the English families that left their winemaking mark in the Douro region over the centuries: Taylor, Sandeman, Graham or Croft, to name but a few. Fine wine and the Douro River may be the lifeblood of the two cities, but visitors will also benefit from a widely varied cultural offer. The Serralves Foundation – with its vast collection of contemporary art and amazing gardens – the House of Music – a multidisciplinary place where you can listen to great music and much more – or Oporto Cathedral, dating from the 12th and 13th centuries, are some of the unmissable features north of the river. Also worth mentioning, on the south margin, are the Grijó Monastery (16 th/17th century), the Serra do Pilar Monastery (16th century) or Casa Barbot, a unique example of the Art Nouveau style in the city. 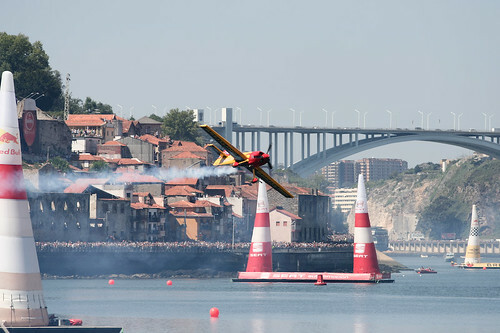 The eighth leg of the Red Bull Air Race will be run over the river, in the Ribeira of Oporto and Gaia Docks area, on the weekend of the 6th and 7th September. The race course will be set between Ponte Dom Luís I and the Massarelos overpass. This info was taken from Red Bull Air Race Official Website. Please check this website for information on accomodation, transportation to and from the places and ticket information as well. The website is available in Portuguese, Spanish, French and English. You can also check the Red Bull Air Race Hospitality website to know more about the event. There’s a magazine on each place available for download, containing information on the race, on the place and on previous relevant happenings. 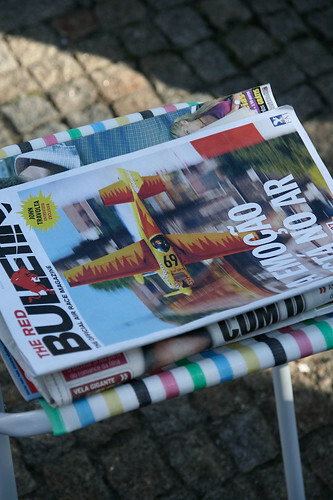 A bulletin will be distributed during the qualifying races and the final race days. All sessions begin at 9 pm. Before WikiSym happens, there is plenty of time to visit Oporto, if you’re already around. So, here are some suggestions of what you can do while visiting our town. This music festival is held at Palácio de Cristal Gardens (Crystal Palace Gardens), on August 29th and 30th. This year’s edition will feature Sam The Kid, Tiago Bettencourt and Mantha, Rita Redshoes, Buraka Som Sistema, Linda Martini and more. All portuguese artists, as usual. The concerts begin at 21:30 and the entrance is free. During the day, there will also be other activities, such as exhibitions, video sessions and theatre plays. This festival will be held on September 6th, at the University of Porto’s Sports Centre Stadium (Campo Alegre, Porto). It will feature Etienne de Crecy, Ladytron, David Carreta and more. See the poster on the left (only available in Portuguese for the moment). There are museums to visit, some more emblematic, some less known, but all worth it. Starting with something well-known, you can visit Serralves Foundation and Contemporary Art Museum, seeing not only the exhibitions about Manoel de Oliveira (the famous Portuguese filmmaker) and David Goldblatt, but taking the Garden tour as well. Other museum to visit is the Soares dos Reis Museum, Portugal’s first Nacional Museum.